Welch was born on November 7, 1862, in New York City. Educated at Wesleyan University in Connecticut, Drew Theological Seminary in New Jersey, and Oxford University in England, he was ordained deacon by the New York Annual Conference of the Methodist Episcopal Church in 1892 and elder in 1894. He and his wife, Adelaide Frances McGee (they married in 1890), would have two daughters. After pastoral service in his conference, Welch was elected President of Ohio Wesleyan University in 1905. 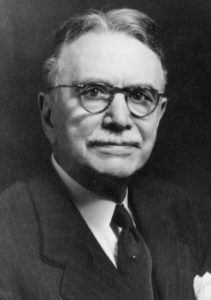 While at the college, he and four other Methodist clergymen organized the Methodist Federation for Social Service (today, Methodist Federation for Social Action), and he served as its first president. The Methodist Social Creed, of which Welch as a primary author, became the model for Methodist and Protestant ecumenical statements of support for labor organizing and opposition to child labor, setting a precedent for churches taking stands on social issues. The Methodist Social Creed influenced a similar statement by the Federal Council of Churches as well as US government labor policy under President Theodore Roosevelt. Welch was elected to the episcopacy in 1916 and assigned to the Japan and Korea area, where he served until 1928. While in Asia, Welch contributed to the formation of the Affirmation of Faith called “The Korean Creed,” which would become one of the affirmations used in Methodist worship around the world. Giving by Christians for the needy, without distinction for race, creed, or color. “We bear witness to Christ by serving all in the name of Christ,” said the bishop, who raised $8 million during his tenure at MCOR, initially for war refugees in Asia, for Europe after World War II, for Palestine after 1947, and then internationally. In 1942, a proposal from MCOR to the board of directors would recognize that war relief would have to be more than just providing necessities to refugees and displaced populations. In addition to relief, the proposal suggested that MCOR should be involved in reconstruction, rehabilitation, repatriation of refugees and prisoners of war, restoration of churches and civil operations, and reconciliation—an effort to restore peace and goodwill. Herbert Welch died in New York City at the age of 106.